This wonderful bay, Gerrans Bay, with at the head of it, Whiskey Slough where we have been staying for quite a few nights, and loving every minute of it. 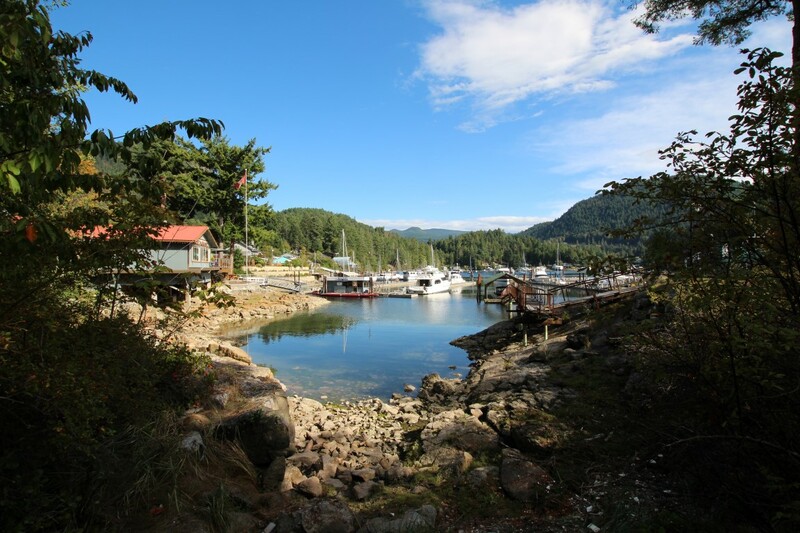 Our very generous friends, Martha and Doug let us stay at their dock,it is adjacent to the government dock, which was just a God send, as Bert was working every day, and could not get there easily with the dinghy. Shendra, Balandra’s owner and our dear friend, would pick him up every morning, and bring him home in the afternoon. We are so grateful for all this, it made our summer very relaxing and fun too! So, these next few photos have to be on the blog too, they help with showing where we were with Curtsy. 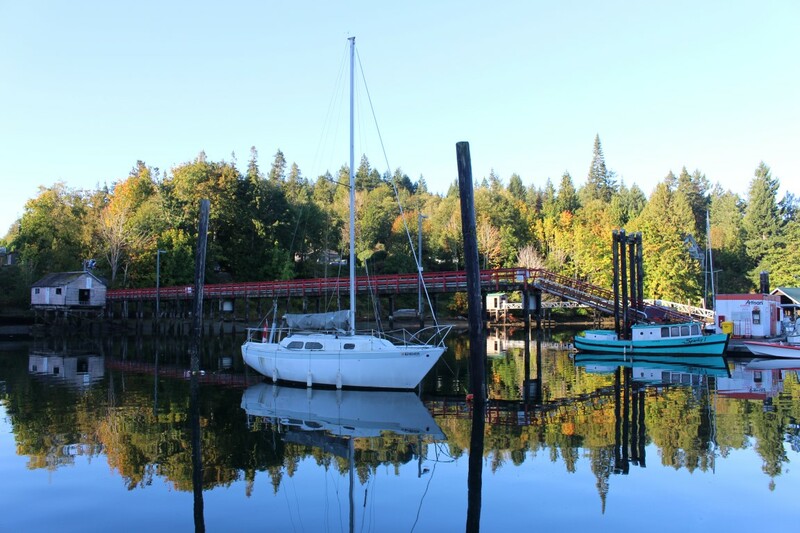 Early morning, looking out at Whiskey Slough docks. 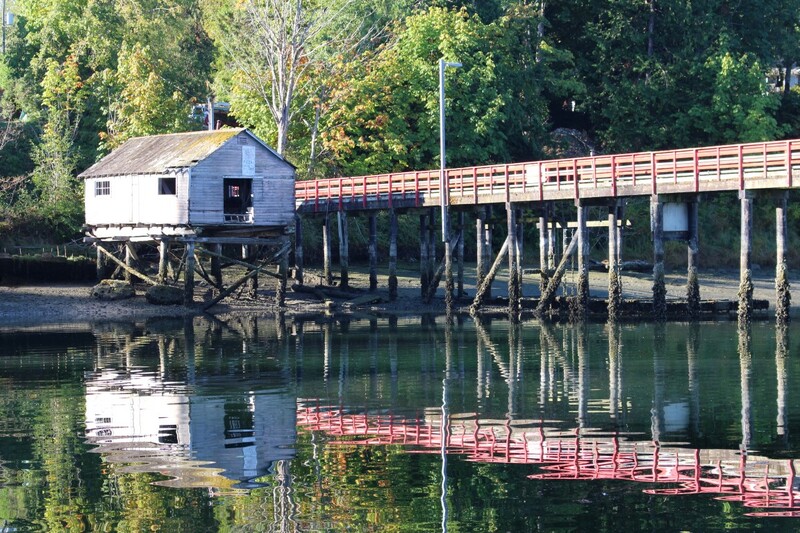 The little old building on pilings, at the government docks. Folks are making bets as to how long it will still stand…..
Not raining…..but still lots of clouds. Our view from Curtsy. We were going to cross Georgia Strait today, but its blowing a hefty 25 knots SE out there, so we are going to wait till Thursday unless the weather is good tomorrow. 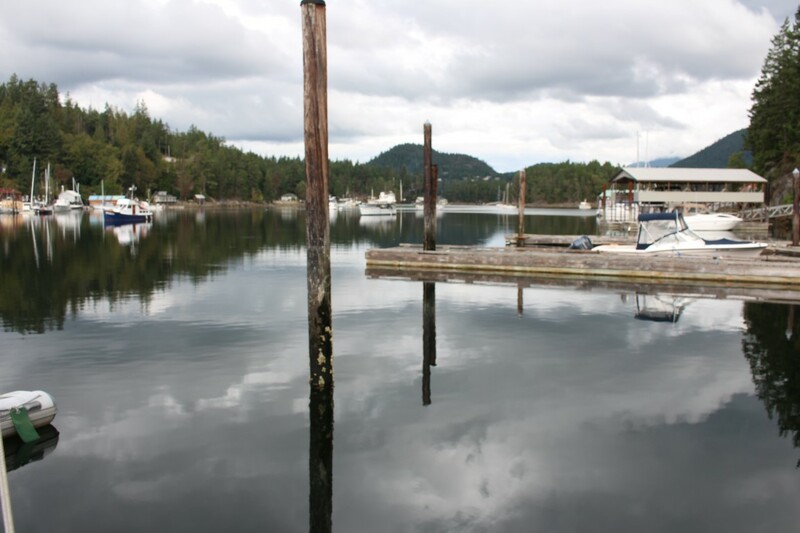 I think we will head towards Nanaimo, anchor there for a night then head through Dodd Narrows and go to Montague harbor. 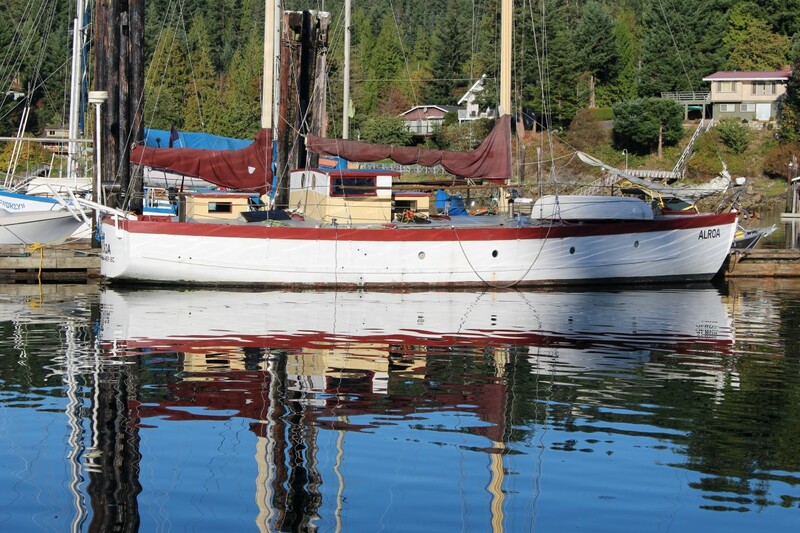 We hope to meet our friends Elly and Wayne in Ganges on Saltspring island, but we would like to put Curtsy in her winter spot by October 1st. 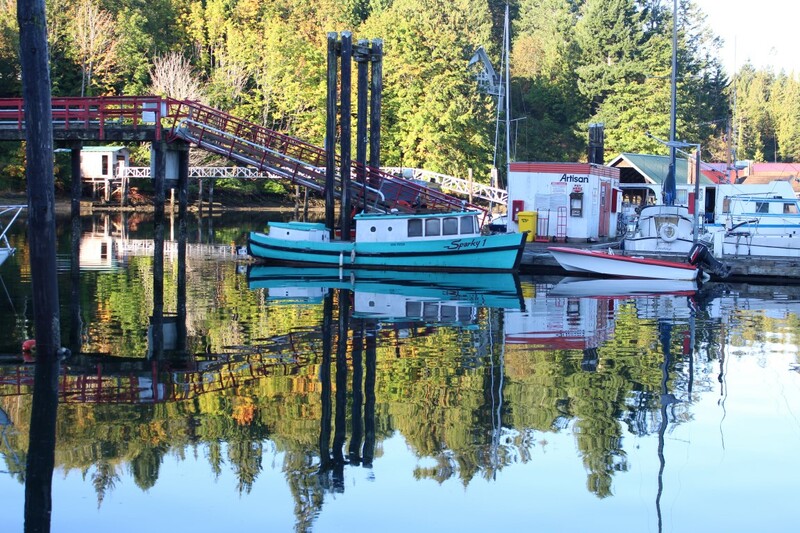 We will see , we might take Curtsy Too , to Saltspring! 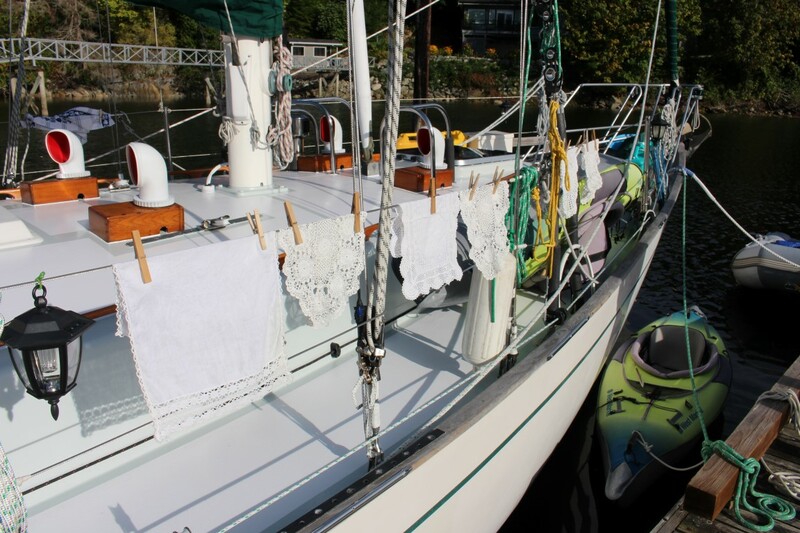 WE have had so many sunny warm days, i took advantage of this last one to wash the little lace curtains for the port holes. Looking at the back of the pub, towards Garden bay. 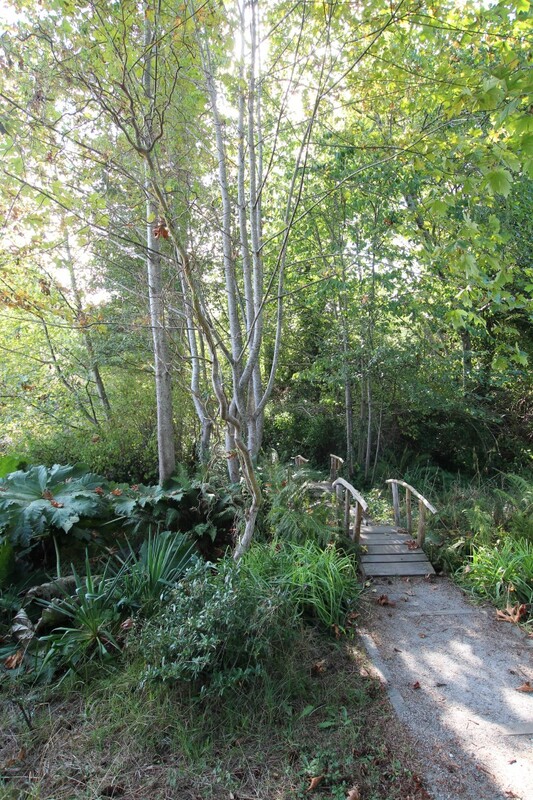 Little walkway to Hospital bay. Low tide! Garden bay pub to the left, looking out into the harbor. A tired shipwright and the Garden Bay pub! 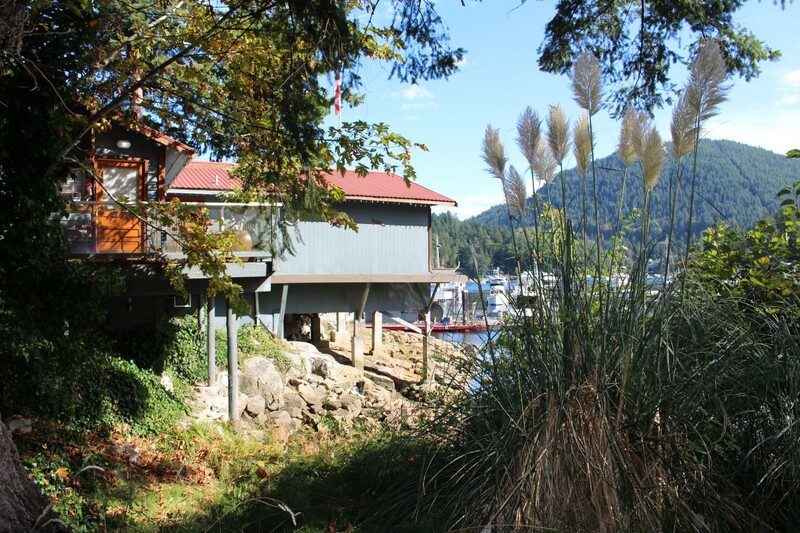 The Garden bay pub is a landmark here in Pender harbour, we can sit outside on the large deck, and overlook Garden bay, and the surrounding mountains, a gorgeous view!! 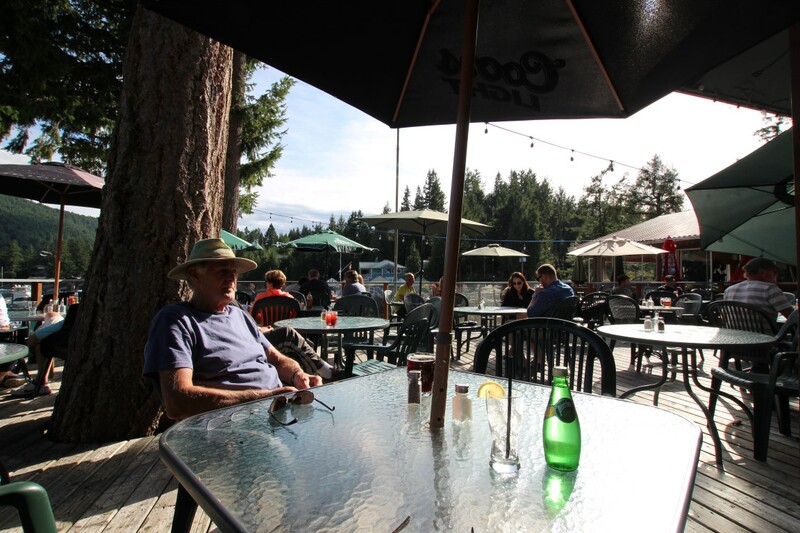 There are some large Douglas firs growing around the pub and two huge Gunneras, a lovely little walkway goes from the pub to Hospital bay, and the old hospital now called the Sundowner inn. 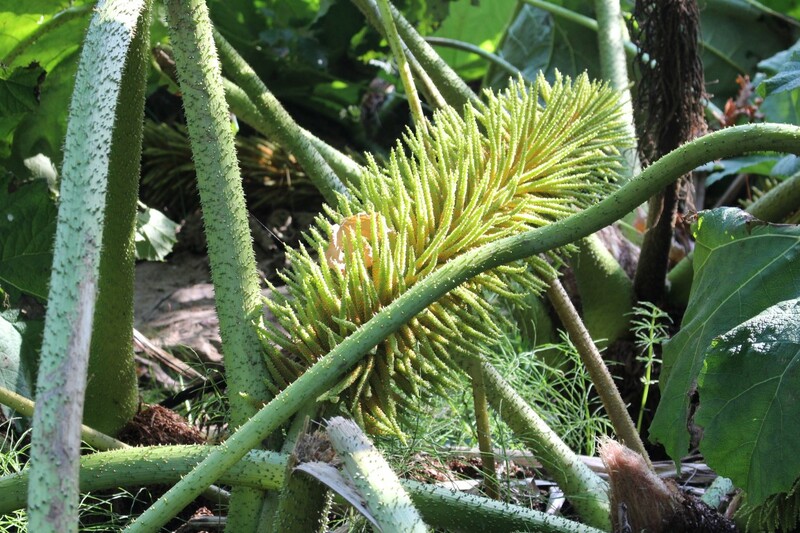 I love this whole area, and its people, its a place worth visiting and/or living….. 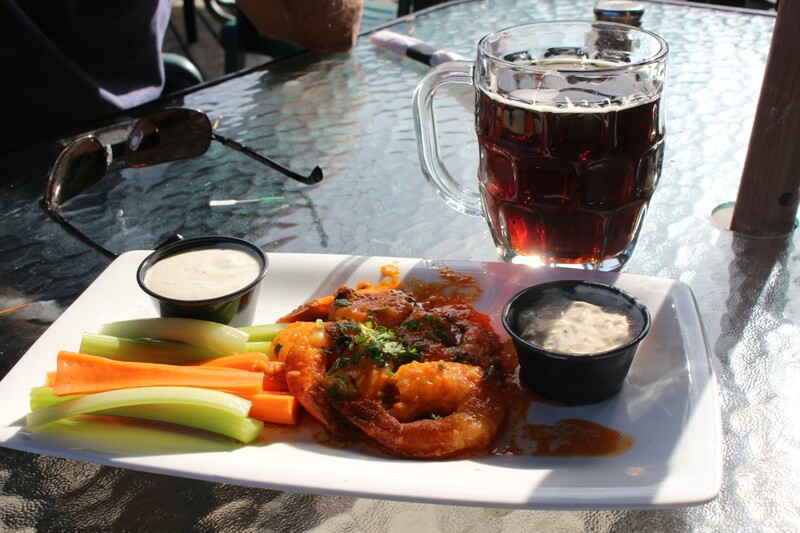 They had a band playing inside , a darn good one too, and we sat in the warm sun, enjoying our drinks. 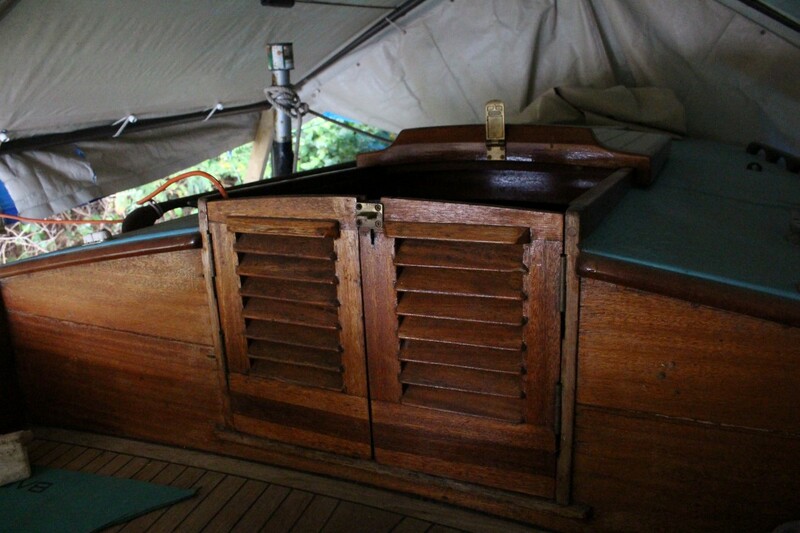 Mahogany cabin doors. Just gorgeous, remember , she was built in 1942!!! This girl is just beautiful!!!! 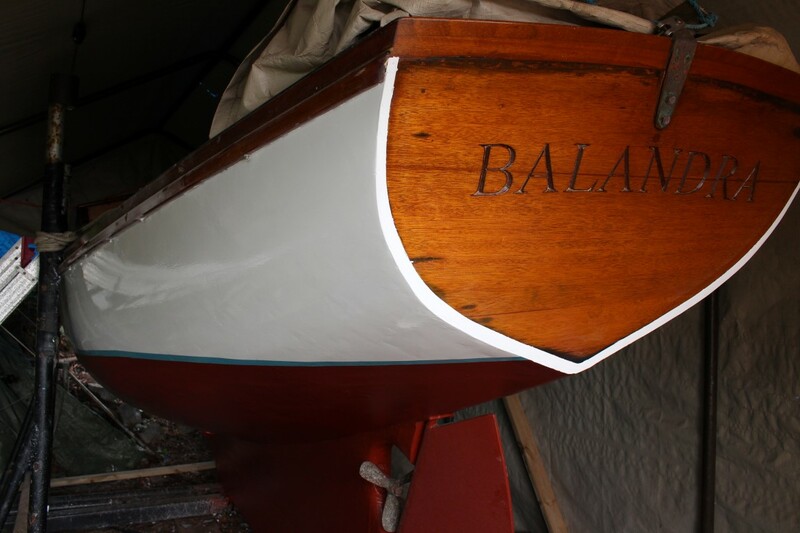 Balandra…..the job is done, and how beautiful she looks!!! 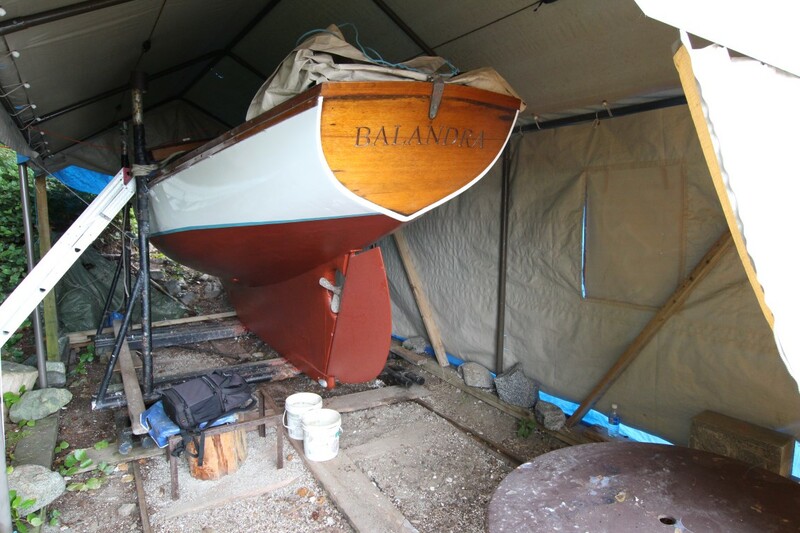 I wrote about this lovely sailboat before, her history and where she is now, she has been sitting quietly on shore, waiting for the last few years ,waiting for a face lift so to speak, she is well protected from the weather and safe, but her owner Shendra, wants her to have a new home, and wanted to first get her repaired and painted. 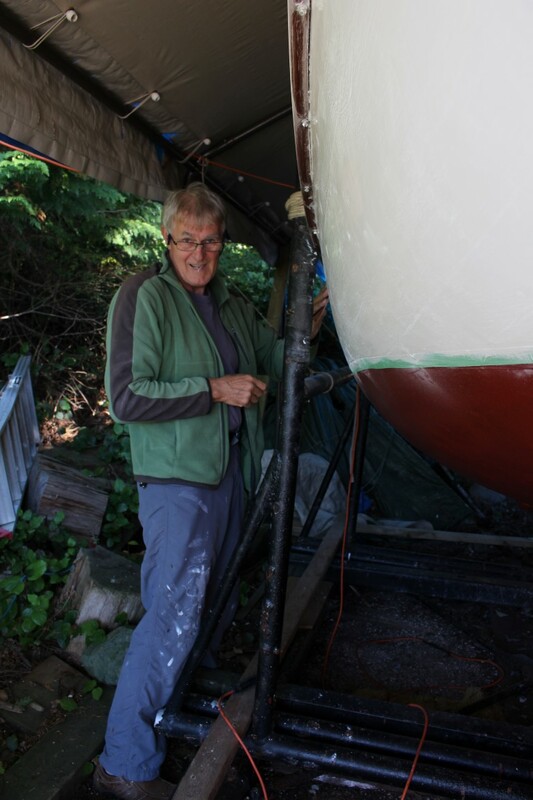 Bert repaired her rudder, as i wrote before, and now, the last few weeks, Bert has been painting her, first repairing her keel, filling in the cracks and spaces, then she received three coats of bottom paint ,well protected!!! I did tell about this before, oh well, it is important!!!! The next job was the hull. Some of the fasteners needed fixing, the putty covering them had come out, so Bert put new putty overtop , sanded it smooth so they then were ready for painting. 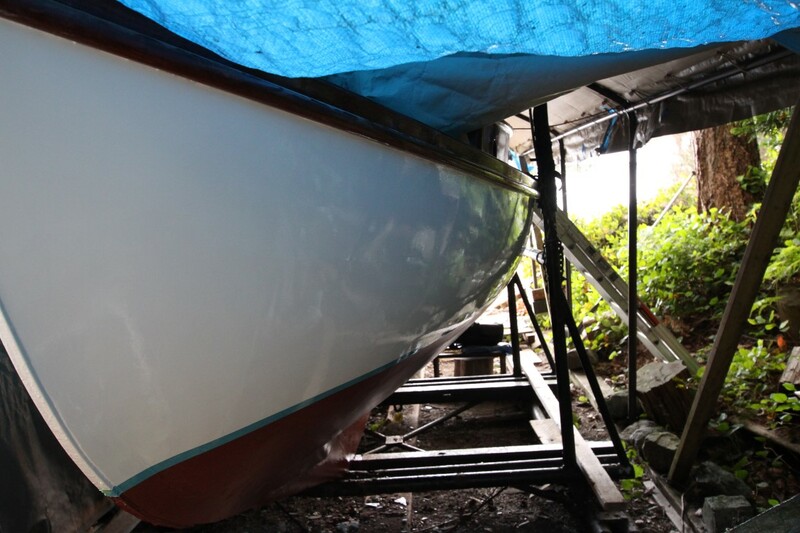 As small as the boat is, 22′,it was still amazing how much work needed to be done. 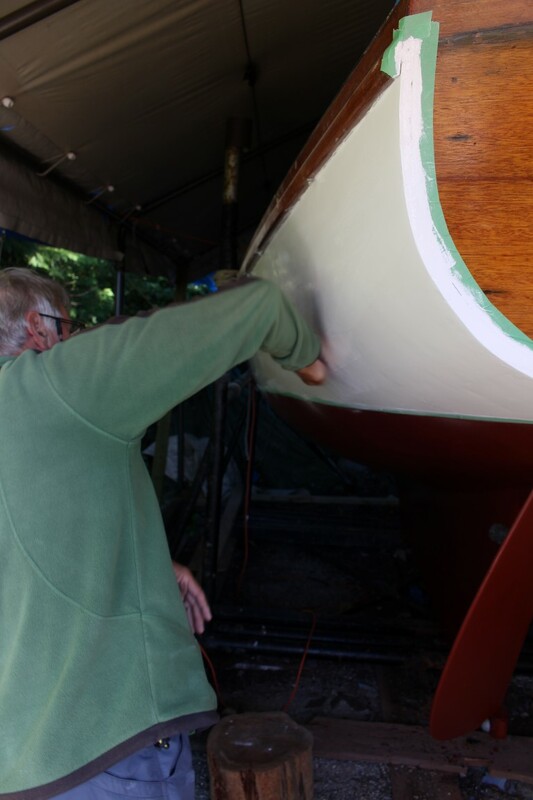 Bert used Interlux paint for the hull, three coats, after every coat he would sand the surface smooth, the paint dried very fast so he had to be careful. 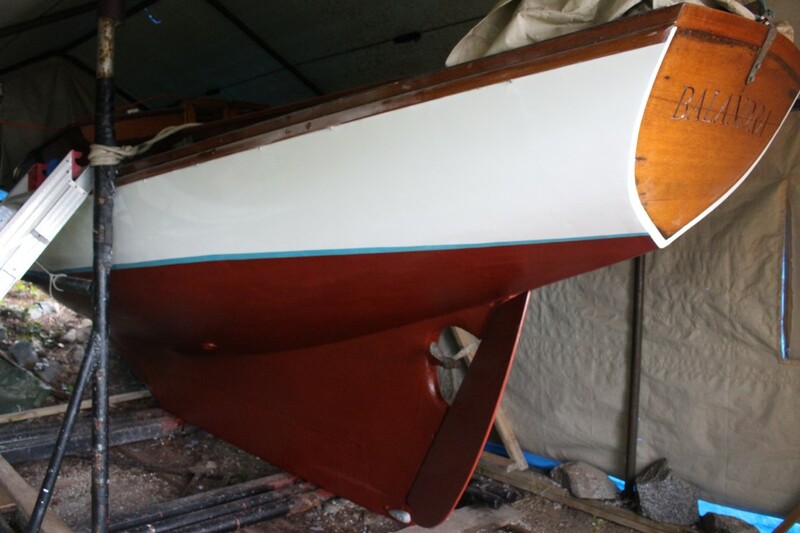 Between the red of the bottom paint and the white of the hull, runs a nice turquoise strip, same color as the deck house. 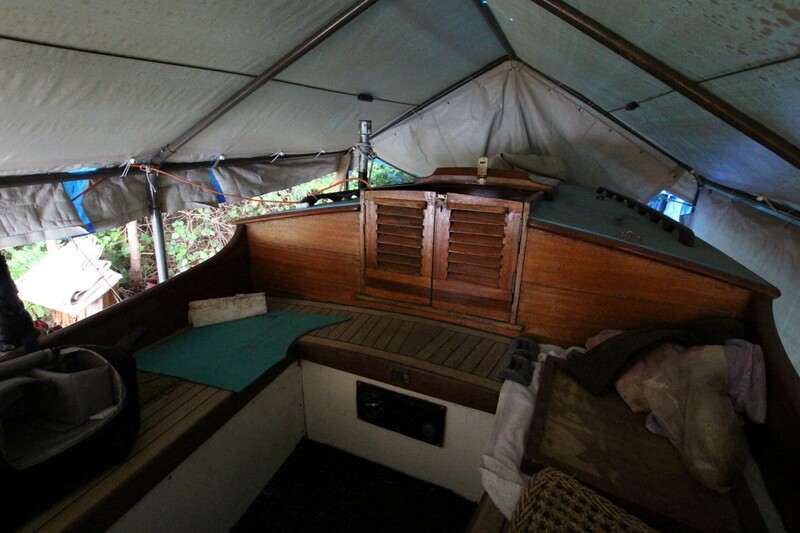 He put a tarp in front of the bow today, and one behind the stern, so she is well protected. 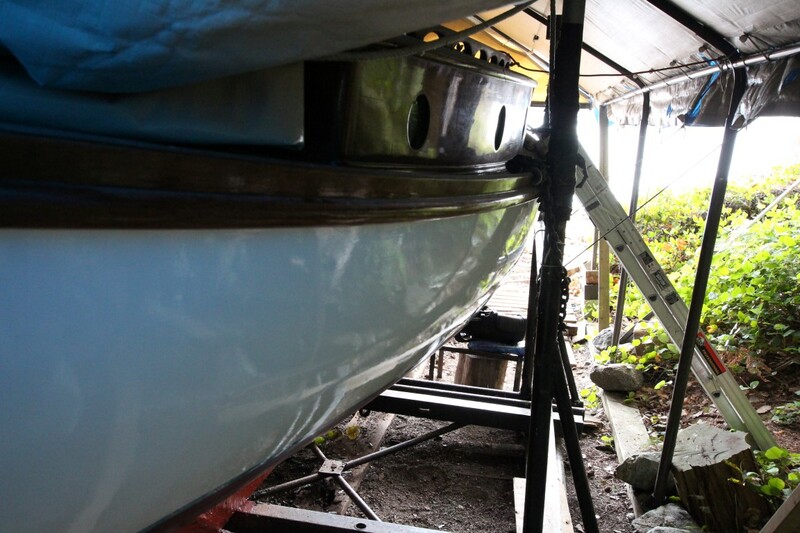 Now she will rest till next spring, when we hope to launch her back into the water. Sanding after the first coat of paint.